Do You Agree that Diversity Was the Biggest Winner at the Academy Awards? Conversation of the Week LXXIV: Do You Agree that Diversity Was the Biggest Winner at the Academy Awards? The 86th annual Academy Awards easily takes the prize for being the most diverse list of Oscars winners in its history. For the first time, a film directed by a black filmmaker - Steve McQueen of "12 Years a Slave" - won best picture and a Latino - Alfonso Cuaron of "Gravity" - took home best director in a ceremony presided over by a lesbian host and overseen by the academy's first black president. And only two of the top six awards went to Americans. 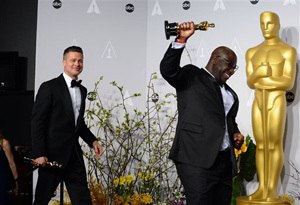 McQueen's grimly historical drama "12 Years a Slave" took best picture, leading the usually sedate filmmaker to jump up and down in celebration after his acceptance speech. The British director dedicated his award to "all of the people who endured slavery and the 21 million people who still suffer slavery today." Cuaron's lost-in-space thriller "Gravity" led the Oscars with seven awards, including cinematography, editing, score, visual effects, sound mixing and sound editing. Some in his native Mexico have been critical that since the attention came for a Hollywood release and not a Mexican-themed film, his win didn't have the same kind of importance. "I'm Mexican so I hope some Mexicans were rooting for me," he told reporters backstage. "Dallas Buyers Club," the best picture-nominated drama about AIDS in 1980s Texas, took two decades to get made after countless executives balked at financing such a tale. Matthew McConaughey and Jared Leto, the two Americans in the top six awards, took best actor and best supporting actor titles for their roles in the film as a heterosexual rodeo rat (McConaughey) and a transgender drug addict (Leto) united by HIV. "Thirty-six million people who have lost the battle to AIDS and to those of you out there who have ever felt injustice because of who you are or who you love, tonight I stand here in front of the world with you and for you," said Leto in his acceptance speech. Cate Blanchett, the Australian best-actress winner for her bitter, ruined socialite in Woody Allen's "Blue Jasmine," used her acceptance speech to trumpet the need to make films with female leads - films like her own and like "Gravity," starring Sandra Bullock. A study by analyst Kevin B. Lee found that last year's lead actors averaged 100 minutes on screen, but lead actresses averaged only 49 minutes. "To the audiences who went to see the film and perhaps those of us in the industry who are still foolishly clinging to the idea that female films, with women at the center, are niche experiences, they are not," said Blanchett. "Audiences want to see them and, in fact, they earn money." "12 Years a Slave" also won awards in the writing and acting categories. 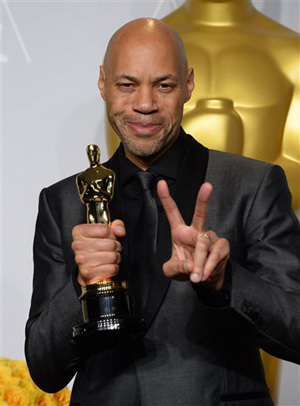 John Ridley picked up the trophy for best adapted screenplay, which was based on the 1853 memoir by Solomon Northup. The screenwriter is only the second black writer (Geoffrey Fletcher won for "Precious" in 2009) to win in the category. Backstage, the "12 Years" team mentioned their efforts to include Solomon Northup's memoir as part of high school study. The National School Boards Association announced in February that the book is now mandatory reading. "It's important that we understand our history so we can understand who we were and who we are now and most importantly who we're going to be," said Brad Pitt, who produced "12 Years." ''We hope that this film remains a gentle reminder that we're all equal. We all want the same: Dignity and opportunity." Lupita Nyong'o was a first-time Oscar winner for her supporting role as field slave Patsey in "12 Years." ''I'm a little dazed," said Nyong'o backstage. "I can't believe this is real life." Nyong'o is the sixth black actress to win in the supporting actress category - and the first major Oscar win for Kenya (the president of Kenya congratulated her in a tweet) - following Hattie McDaniel ("Gone with the Wind"), Whoopi Goldberg ("Ghost"), Jennifer Hudson ("Dreamgirls"), Mo'Nique ("Precious") and Octavia Spencer ("The Help"). Foreign language film nominees included "The Missing Picture," the first-ever Oscar-nominated film from Cambodia. "The Act of Killing," a dark look into the mass killings of communists and ethnic Chinese in Indonesia in the 1960s, was nominated for best documentary feature. In her second time hosting, openly gay Ellen DeGeneres sought to make celebrities more like plain folk. She passed out slices of pizza to the front rows at the Dolby Theatre, then passed the hat to pay for it. She also tweeted a "selfie" with such stars as Meryl Streep, Julie Roberts, Jennifer Lawrence, Bradley Cooper, Pitt and Nyong'o. The shot "made history," DeGeneres told the audience later. It's since been retweeted more than 2 million times. Follow AP Film Writer Jessica Herndon on Twitter. I don't look at the diversity of the winners as a milestone at all. Selecting for minority groups is just the reverse of selecting against them. The ideal place is a world where award winners are selected on pure performance, regardless of what groups they belong to. Until we look at race as an issue that is a human-generated topic, we will never be able to heal the wounds from slavery or the civil rights movement. This is a fair point, except that the win of diversity is that now they are "selected on pure performance, regardless of what groups they belong to" versus being ignored by the academy. It is a human generated topic that needs to be addressed and moved forward, not ignored. I agree and disagree with you with the above comment, I disagree in the matter of not looking at the diversity of the winners as a milestone, and I agree in the matter of the ideal place is a world where award winners are selected on performance only regardless their racial background. I definitely see the diversity of the winners as a milestone, because even though we should judge performers on their performances only and not their ethnicity, that is not the world that we live in now or that our ancestors lived in ages ago, this is something that has been fought for and is still a work in progress, so the fact that society has accepted diversity into Hollywood theatre is definitely a milestone in my eyes! I was going to post essentially the same thing. Now on the other hand, if Leo had won, that would have been a great milestone. I disagree with the fact that you think it isn't a huge milestone. I think any form of a diverse event is a huge milestone. For us to be able to celebrate and engage with diverse roles in the academy awards is a great thing to embrace. I agree that in an ideal world is where award winners are selected base purely on performance. But because diversity is such a hard thing in our society, it would be great to see that people are being selected and praised only due to their talent ability rather than their skin color. But since we aren't living in a world like that, I think its a good step in the right direction to have a diverse selection of winners at the academy awards. This is a huge and vital step forward. The white washed and male dominated academy awards has been a thorn in the side of incredibly talented minorities for an incredibly long time. For the first time I feel like those who deserved to win did, regardless of color, gender, role, or any other discriminatory or ignorant reason. The fact that you can count on your fingers how many black actresses won is absolutely appalling. The path of acceptance and and diversity does not harm anyone or fail to reward "real" talent, it opens the door to everyone and no one loses. As Lupita put it "your dreams are valid" and every man woman and child deserve to know that and witness it. Ellen was a great host that really brought life to the show,her sexuality has nothing to do with it, as it shouldnt. Isn't the fact that you feel the need to count the amount of black actresses who won, and the instance of Ellen's homosexuality, indicative that there is still an issue in regards to inequality? If nominees have an equal chance of being selected, as mentioned above, why do we even pay attention to the racial and minority backgrounds of the winners. I believe that you would also find that people concentrate on why people lost too much. Leonardo DiCaprio has given stellar performance after stellar performance, but is the reason why he has not won an Oscar is because he is a white male? I certainly do not think so. I absolutely agree with you that because we feel the need to count the amount of black actresses who won and Ellen's homosexuality is why inequality is still an issue. If inequality wasn't a issue in our society then headlines about an African American winning an Oscar and a openly gay women hosting the show wouldn't be headlines. The headlines would be about Ellen hosting the show because that is what she does best and she is hilarious, not because of her sexuality. I also like how you bring about Leonardo DiCaprio because he does give amazing performances and still has yet to win an Oscar and this is not because he is white. The race and ethnicities should be of no factor. We see them as actors, actresses. The issue is that we see these people as their skin color. Calling Brad Pitt a "white actor" would seem out of place. But people almost feel obliged to call Lupita a "black actress". They automatically are classified by the one thing that makes them stand out from the norm. The academy awards were diverse yes, but that shouldn't be something to be paraded. It should be the norm. I completely agree with you that race shouldn't matter. We shouldn't consider people a black actress or a white actor. It should be the norm to ignore the color of people's skin, although that doesn't always happen. I agree that we should not put race and ethnicities as the factor. but is it true that all the people as the same view? of course no,..we do differ and people still hold racism instead of looking of the great jobs that people do in a lot stuffs, we have to change and we should not end up here, this event should be continuous and not to remain as the history. I completely agree with you. It shouldn't matter what their race is. When you look at actors and actresses we don't really base their awards on the color of their skin. We look for the ones who can actually act. I totally agree to everything you said. Being diverse in the 21st century should be completely normal and something that everyone around the world should be used to. These individuals that won the awards should only be recognized because of their amazing ability to act on the big screen, not because they are "white" and not because they are from Kenya. I agree. Everyone should be used to everyone else's skin color. Everyone at the Academy Awards won because they deserved to win, not because they either had black or white skin. This shouldn't even be a story! Good for the people that won who aren't white. I definitely agree that diversity was the biggest winner at the Academy Awards. I did not watch the Oscars but after reading this article, it feels good to know and to see things becoming more and more diverse. People from other countries and from different backgrounds are being awarded very big and prestigious awards. At the the same time, the background of these individuals should not be such a big deal. Each individual should be looked at as what they are. Actors and actresses. I don't believe classifying these actors by the color of their skin is what should be done. I read this article with a look of disgust. I understand that it is a big milestone for an African American director to win for the first time but the way this sounds is that it is based on the fact that she was black and not because of her caliber of directing. The movie was fantastic and she should be commended on the way she directed and not be generalized by her skin color! I agree, why is it that because she is black that she won? why do people just leave that out and base it on the quality of work and the message being sent. Who cares what race the writer or actors have!! I feel like the movies that are being made today and are in the areas in which the Academy looks to give awards (when was the last time we saw an action movie win?) speak to whats wrong in the world and ideally what we would like to change. In doing that you have people from all races and nationalities stepping up to make it happen, when you get that you get diversity. People just want a place to express themselves and get their point across to so many, and what better way then a moving film that strong people in hollywood support! I believe the diversity among the winners at the Academy Awards is a positive thing. I have read some other posts that believe that the winners may have been picked solely on their race, but I do not agree. In cinema history, there have mostly white movie stars who have been getting roles in blockbuster movies. Think about major blockbuster movie series James Bond, Indiana Jones, Twilight, The Hunger Games, all these movies are dominated by whites. Sometimes the acting in these movies is sub par and becomes just another movie to add to the actor or actresses resume. I believe some of the best acting comes from those who have never taken an acting class and who are true images of diversity, such as Barkhad Abdi in "Captain Phillips". When watching award shows, I rarely think "Oh she just won best supporting actress because she is black", I assume that who ever wins the award is there because of his/her acting. And if voting for someone to win an award based only on their race was how the awards were awarded, then there would probably be a lot more diversity. The point is that films have become more and more diverse, not only through actors and directors, but also through the topics and stories they portray. I think the diversity is a great thing and I hope it is still valued in years to come. I agree with you. Although I think it is unnecessary to refer to actors or actresses as white or black because like you said, it is based on their talents. And I am pretty sure we can all see who is black and who is white. It is amazing that Barkhad Abdi was a taxi driver before his part in Captain Philips. Something like that is more amazing to me that the color of someone's skin. I do believe this is a major step in the right direction though. But I think we, as a country, need to get to a point where we recognize individuals based on their talents, not their skin color. I noticed how diverse this Academy Awards show was when I first saw the nominees. It is nice to see such a broad spectrum of winners this year. It definitely was the most diverse awards show I have ever seen. I am not sure the academy chose these winners because of their diversity. I choose to think the academy chose these winners based upon the acting, quality of the movie, etc. Diversity was the biggest winner at this year's Academy Awards, but the fact that we still have to acknowledge the fact that this many Hispanic or African Americans won is why we are still considered a racist nation. Whether you win an award or not should have nothing to do with your race, gender, or sexuality. The fact that we acknowledge this is why we are still in a fight to beat racism in the United States. It is sad that the Academy Awards have always been dominated by white males, but the fact the President Cheryl Boone is trying to change that and make the Academy Awards more diverse is a great step. I have personally seen Gravity and 12 Years of Slaves and they absolutely deserved those awards because they are great actors and directors NOT because of the color of their skin. I agree with you that it was TALENT that was recognized this year, not just color or sexuality. That was the most refreshing aspect of this years award show. I also feel, like you, that the very fact that we are having this discussion proves that our nation is still backwards in many ways in terms of how we view and tolerate discrimination. From having it's first black president, to all the diverse group of people that were receiving awards and the hostess herself, I'd say this is a step forward. Nominating actors based on their performances on this award ceremony certainly brought light to the many talented people of different races and it certainly brought actors and directors of different ethnicity together towards a common goal.